The Asphalt 5 HD iPad game app is one of the many titles available on the App Store that are produced by UK based games company Gameloft. 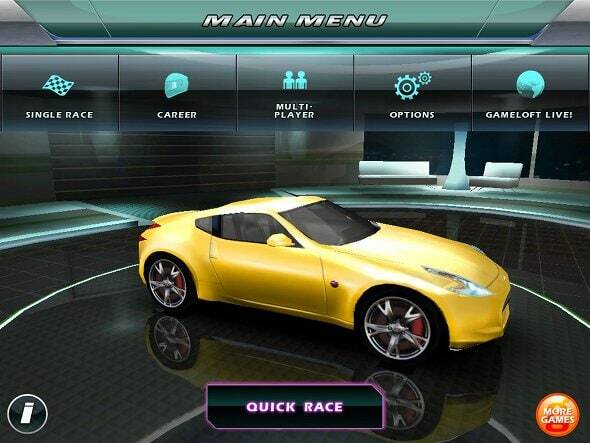 Available for £3.99, it offers a vast library of cars and tracks that you can race on, as you complete all the tasks given to you to earn money and upgrade your collection of cars. Racing games such as Asphalt have always proved popular on consoles in the past, be it Mario Kart or Gran Turismo 5, and I wouldn’t be surprised if the Apple iPad version also followed this trend. Paired with a catchy soundtrack, the first thing you’ll see when you open Asphalt (besides the introductory video, of course) is the main menu, which is your central hub for everything going on within the game. From here, you can choose to take part in a quick race, or launch your career, in which you can build up your collection of cars, fine tune those you already have, and of course, win races and various challenges. From the main career screen, you can flick through all the available events to see which ones you have yet to complete. Some of the events will be unavailable until you’ve completed previous courses, so you can unlock new ones each time you win. You can also admire your garage of cars, flick through the ones you do and don’t own, and tune up your vehicle ahead of the next race. This is a really awesome feature that really adds to the career aspect of the game, as you improve your garage when you collect money from winning races. 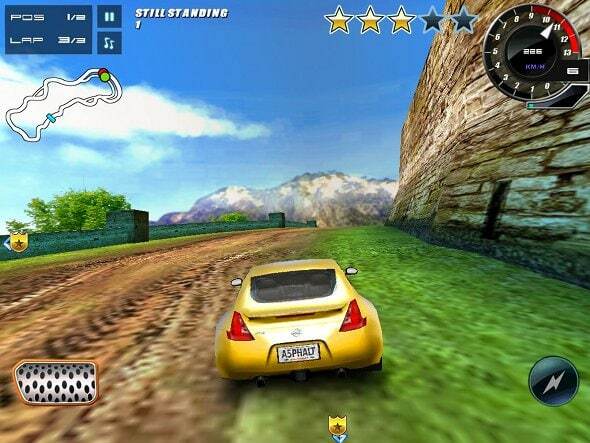 Of course, after all this, you can race too, which is always a plus when playing a car racing game! Events range from a regular race, to special challenges. You may be required to go on a cop chase, where you need to eliminate a number of opponents from the race to progress, or have a one on one duel with an opponent, where you are required to win the race to progress. >When racing, the controls are super easy to grasp. The car will be accelerated for you (unless you choose to turn auto accelerate off), leaving you to handle the steering, with the help of the accelerometer, the brakes, and the turbo boost if you want to pick up a bit of speed. Whilst on the track, you’ll come across some boost icons which you need to drive in to in order to gain Nitrous. Similarly, you may come across a spanner icon, which will repair any damage that you may have caused by driving like a maniac trying to knock another car out of the race. If you ever get bored of single player mode, which you most probably won’t do anytime soon, there is an online multiplayer option too. Using the Gameloft LIVE system, you can take on other players from around the world, which is an absolutely fantastic (and free) feature to have for the game. With top notch graphics, enjoyable gameplay, and a career mode that will keep you entertained for hours, the Asphalt 5 HD for iPad game app is without a doubt one of the best games out there for iPad. If you haven’t done so already, you should definitely download this one for yourself for £3.99.